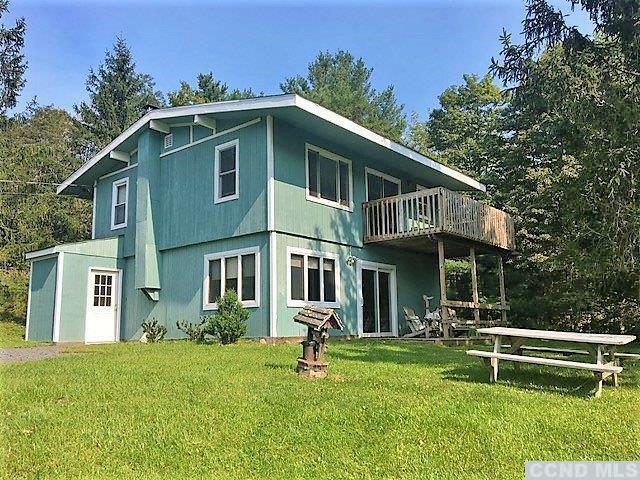 Country getaway in the trendy Catskills has beautiful mountain views access to creek and lovely tree lined open front yard. 3 bedroom, loft and 1.5 bath home is move in ready comes fully furnished plus rider mower in the shed! Many updates through out including stylish kitchen with granite counters and SS appliances, Bruce hardwood floors, Berber carpet and tiled bath. 3 separate heating options will keep you warm all winter, kerosene monitor, woodstove and electric base board are efficient and cost affective choices. Nice surprise is Lewis Creek, a small tributary that feeds into the Batavia Kill, private path leads down from house to your personal Creekside refuge- Nice!